What car should you rent for a road trip to Key West? Florida is one of the awesome tropical paradises in the United States of America. Yet beaches, stunning views, a fantastic climate and wild areas like the Everglades National Park are not everything you will find there. I in fact strongly encourage you to rent a car to treat you to a road trip from Miami to Key West. While there’s a Miami to Key West bus, in fact, it won’t let you stop to all the places we’re telling you about in this article. 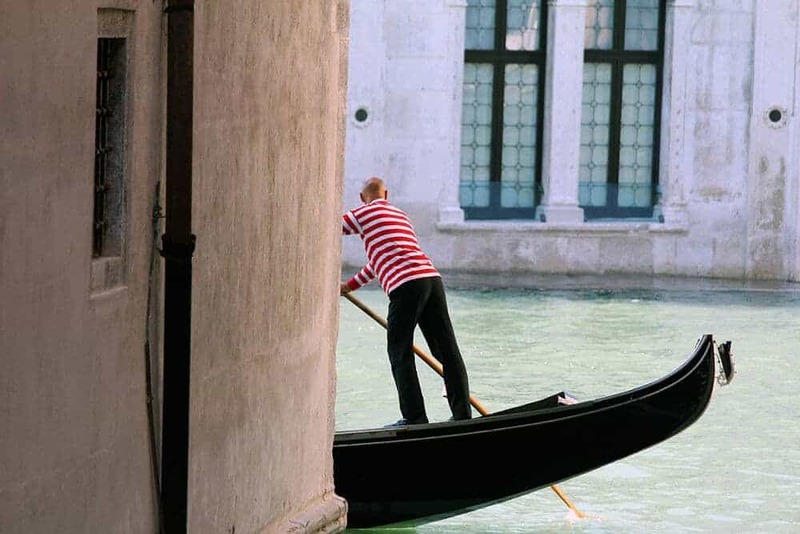 Having your own car, on the contrary, will allow you to have much more fun, as you’ll be able to stop along the road: believe me if I tell you that there are so many things to do and see on this Florida road trip itinerary. An example? 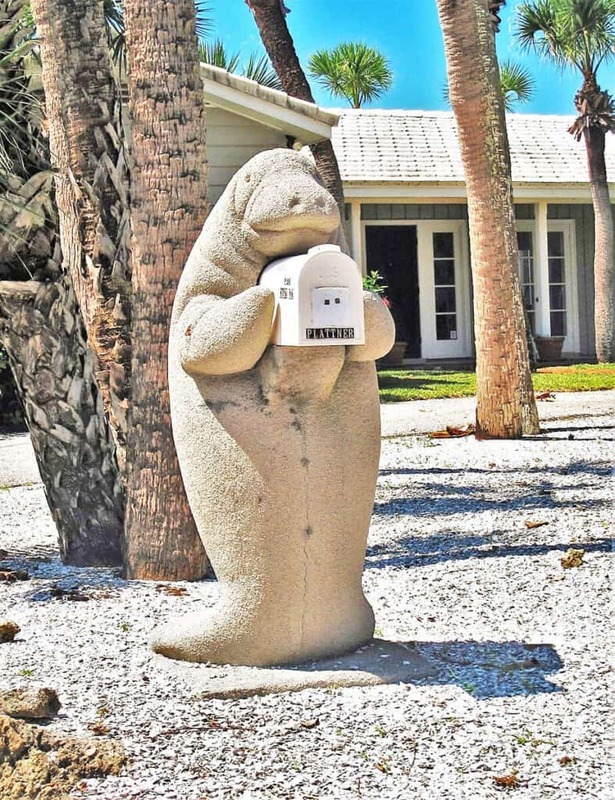 I don’t know if it’s your thing, but I particularly liked to take photos of the mail boxes: people here have the cutest marine inspired mail boxes ever! Taking pictures of fun mailboxes is one of the highlights of the trip from Miami to Key West! Key West is the Southernmost town in the United States, just 90 miles from Cuba. It is connected to Miami via the Overseas Highway. The driving distance from Miami to Key West is about 125 miles. Route 1 goes through the Keys in a scenic and sunny trip. The first bridge was built by the Florida East Coast Railway, but it was heavily damaged by a hurricane, and then sold to the State of Florida. They decided that a highway was to be built on the same path. Although there are also buses that drive each day tourists up and down the Overseas Highway, I think the best way to appreciate this road trip from Miami to Key West is by renting a car. It takes about four hours to get to Key West. 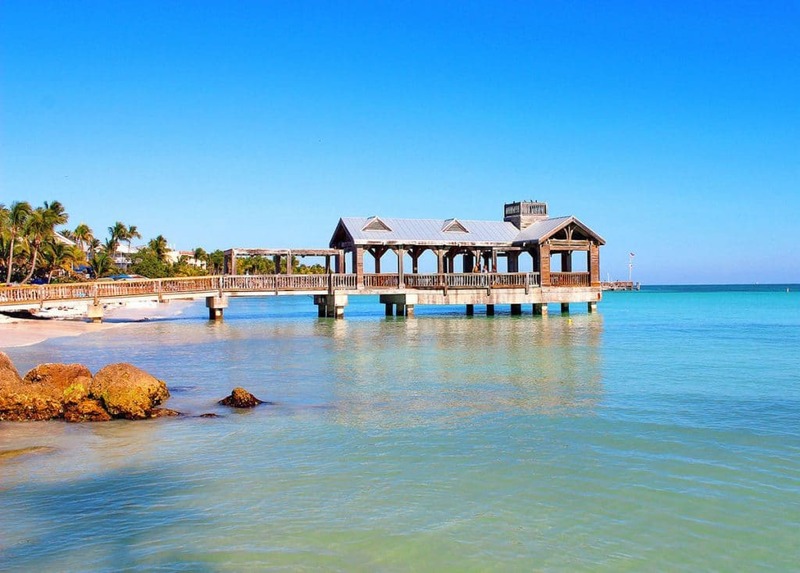 If you have limited time, then consider at least a Key West day trip from Miami. 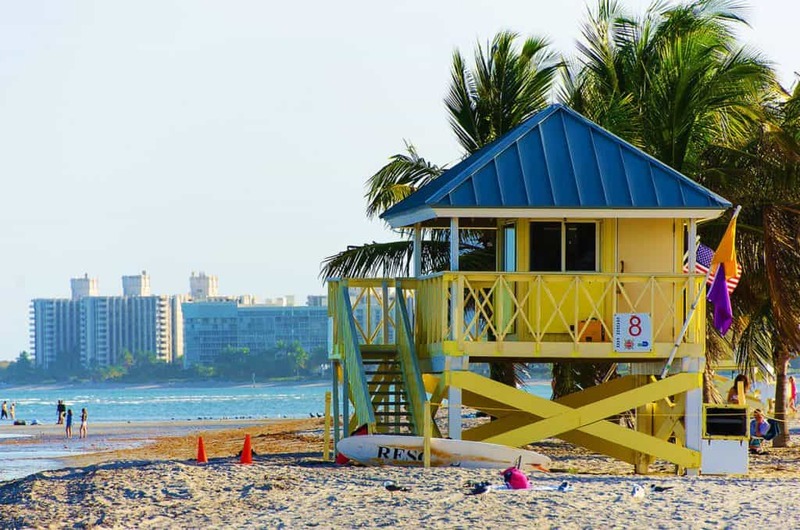 If on the contrary you’re planning to stay on the Keys for a few days, then you’ll have all the time you need to enjoy the many things to do during this Florida road trip itinerary. Sure, the driving distance from Miami to Key West might not look huge but it’s really packed with nice things to see and do! If you have decided to rent a car, I suggest asking for a Sunpass. Even if you’re only planning a Key West day trip from Miami. By crossing the toll-paying areas, the car’s license plate will be photographed and checked. Each rental company offers different deals, however, a flat-rate daily payment is typically the best way to go. If one day you won’t go through any road toll areas, then you won’t have to pay your daily fee for that specific day. In case you’re going through a Florida road trip itinerary with your own car, or if you don’t want a Sunpass, then the toll fee will be charged directly to your credit card. It’s up to you! Of course it depends on your budget. We went for a Ford Mustang, first because I’m Mustang-bsessed, and then because we really wanted to open the top: it’s so much fun! You can opt for a convertible or a Jeep Wrangler if you like to open the top once in a while (be careful, you can definitely get sunburned!). Another bonus of a convertible is that you will be able to take great pictures and awesome videos: the Overseas Highway crosses 42 bridges! So yes, in case you were wondering, the Route 1 in Florida is definitely one of those cool Instagrammable places so keep your camera at hand. What if you don’t want to drive? In case you don’t feel like driving or renting a car, you can book a day trip to Key West from Miami. This one for example has a pretty useful pick-up service from many hotels in Miami, and will let you explore at your own peace. It’s the best option in my opinion because you won’t have to get stressed if the drive to Key West is not your thing, and yet you’ll still be able to plan your day according to your schedule. It’s like having a private driver… on a budget! Check out rates and availability here. If you have time, make sure to stop at Coral Castle, even for a short visit! The first point of interest you’ll find while driving from Miami to Key West is Homestead. This getaway to the Overseas Highway has some interesting highlights. 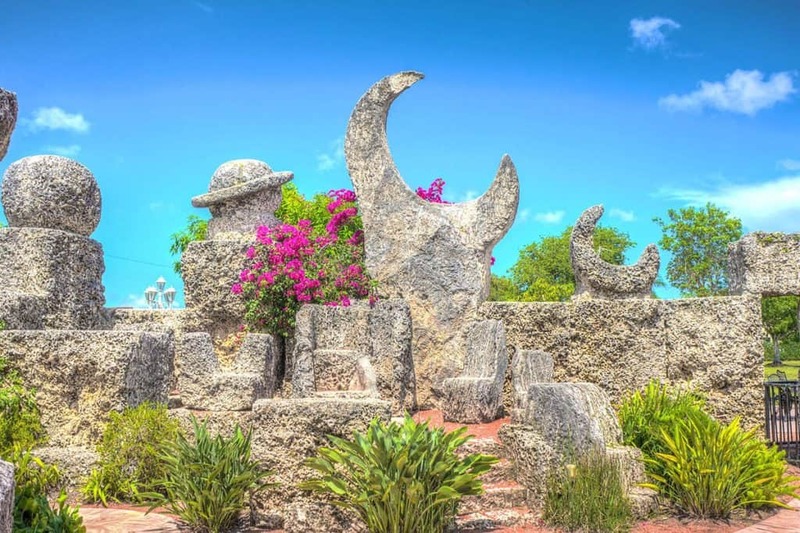 Coral Castle is a famous area not far from the city. It’s not really a castle, and definitely not made of coral, but it has been compared with Stonehenge. No, not by me. With all due respect, while I really liked Coral Castle, I don’t think it has anything to do with Stonehenge. Yet it’s an interesting spot with a pretty interesting story, that also your kids will appreciate. Ed Leedskalnin, its creator, quarried and sculpted over 1,000 tons of sedimentary rock into what looks like a fantasy world. Many sources, and even several tv programs here in Italy, claim that this place is “inexplicable“. At a certain point it became so famous that Billy Idol wrote “Sweet Sixteen” about this place. Yet the most amazing thing about Coral Castle is probably that the whole site was created just by one person. Ed was tiny, just 5 feet tall and weighed 100 pounds. Not what you’d call a giant! Allegedly he started working on this project when his fiancee left him. He wanted to prove the world he could do something incredible. The Overseas Highway and the Seven Mile Bridge are two of the most instagrammable spots! Not far from here you can find the Homestead Miami Speedway: if you are a bit of a motorhead like us, you definitely have to stop here! Check their program online to see if there are interesting events you want to attend. This is a Nascar Speedway, which is something that swept Aldo off his feet, as we don’t have Nascar in Italy! Getting some fresh fruit for your road trip to Key West is also a great idea. The best shop you will find on the road is Robert is Here, a fresh fruit paradise where you will also find delicious Key lime milkshakes, homemade jam and fresh produce. 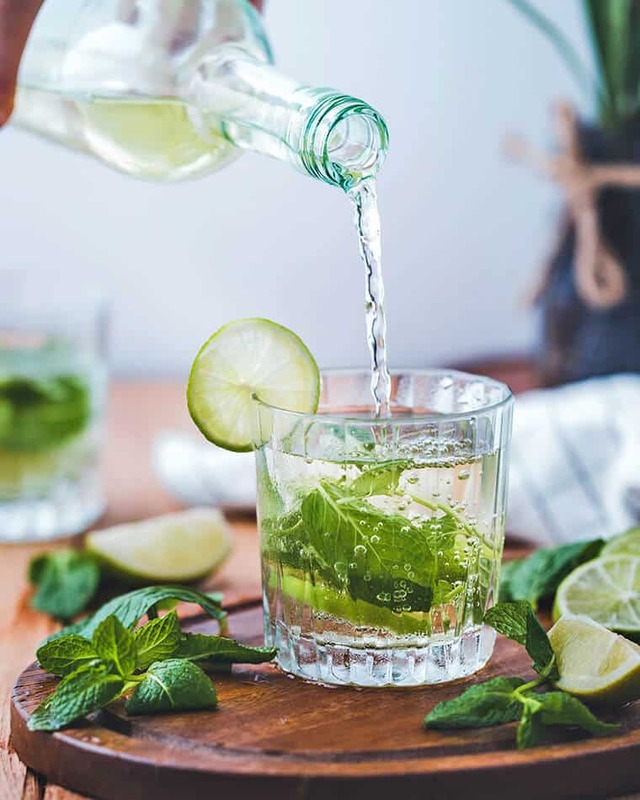 Stock up before you move onward, even if yours is just a Key West day trip from Miami, it’s definitely worth your time! Be ready to take pictures of the road signs that warn you… about the “alligator crossing”! The first island of Florida Keys is home to two State Parks, a National Park and a portion of a National Marine Sanctuary. My favorite was the John Pennenkam Coral Reef State Park, because it’s another one of those uncommon and yet engaging places not many people know about. It’s after all the first undersea park in the US, that you can visit with a glass bottom boat tour, by scuba diving or snorkeling. Even if canoeing and kayaking are popular activities, being a reef park, I’d suggest a glass bottom boat tour, in case you don’t want to jump in these blue waters (it’s always a chance, how can one resist?). It’s also the perfect place where you can test your waterproof casing for your camera: underwater photos and videos here are always breathtaking! At the Visitor Center you will find a 30,000 gallon saltwater aquarium and you can watch nature videos in a nice theater. Nice bonuses are the free beach wheelchairs and a 24 hour free Wi-Fi service. There’s also another very interesting Marine Sanctuary, the Florida Keys National Marine Sanctuary, that protects the waters surrounding the Keys, from South Miami to the Dry Tortugas. You will have to book a snorkel tour or dive trip through a third party, because the Sanctuary doesn’t offer this kind of services. If you are in love with marine life, there’s an amazing ethical tour from Key West: you’ll get to cruise in the ocean while watching bottlenose dolphins frolicking in their natural habitat! Check out more info on this dolphin watching tour here! Because of the sensitive nature of the habitat, dogs aren’t allowed, so if you are visiting with your pet, you might want to go to the John Pennenkam Coral Reef State Park in stead. Leaving your dog in the car is absolutely not an option, because it’s always pretty hot! If you are tired of the sea, something you will definitely see a lot on your road trip from Miami to Key West, you can have a relaxing walk in the forest at Key Largo Hammock Botanical State Park, that covers one third of the island of Key Largo. 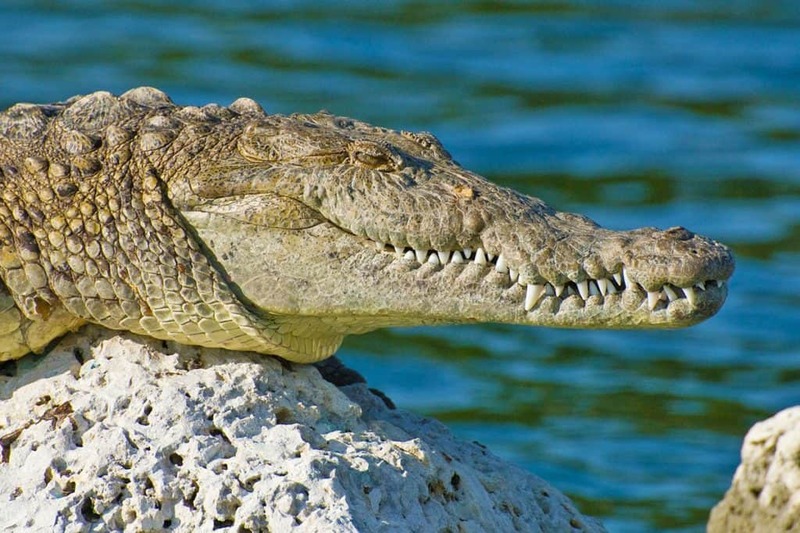 This park is home to 84 protected species of plants and animals, including the American crocodile. Another interesting stop on our road trip from Miami to Key West is Marathon Key. Here you can visit a sea Turtle Hospital, reserving an educational tour beforehand. This isn’t a zoo, so please, be respectful of the animals, the volunteers and the veterinarians. The guided tour lasts about 90 minutes and will include a presentation on sea turtles and a behind the scenes tour of the hospital facilities and rehabilitation area. At the end of each tour, guests are invited to feed the turtles who live permanently at the hospital. The tickets costs 22$ for adults and 11$ for children, but make sure to call first before you go, to make sure they’re open and that you can go for a tour. Another educational facility that you might enjoy is the Dolphin Research Center. This nonprofit corporation wants to offer a home for life to the dolphins, establishing an educational centre where people can learn to understand these beautiful animals. Their ultimate goal is to promote a peaceful coexistence, cooperation and communication between marine mammals and humans, and to preserve the environment. We’ve been there on our road trip to Key West and I remember it as a particularly peaceful place. Not to mention that here I bought a small starfish plush for one of my cats: it’s been his favorite toy until his very last day. Drinking a cocktail while waiting for the sunset in Key West is a quite popular activity! The most beautiful beach in this area is Sombrero Beach. You can find it about one mile off the Overseas Highway, at mile marker 50 on the Atlantic Side. There’s a particularly nice park here, it’s handicap accessible, with a children’s playground, bathrooms and picnic facilities. This is a good area for snorkeling, and we absolutely loved to watch the sunset on the warm sand: you probably won’t believe me, but there was no one else around and it was the most romantic evening ever! An unusual but very popular activity on Marathon is fishing for tarpon. The tarpon that visit this area each Spring love to hang out at bridge passes. They can grow up to 8 feet long and weight over 200 pounds. These huge fishes can be also hand feed from the docks of Robbie’s on Islamorada. According to your schedule, see if you want to plan a whole day tour from your road trip from Miami to Key West. If you are on a Key West day trip from Miami, you might not have enough time to stop at Robbie’s. I suggest you actually write down all the things you want to see on your road trip: if you have the chance, why don’t you stay for a few days to enjoy one of the most beautiful areas in Florida? Oh, before I forget I have a very important note I feel I need to add! If you’re planning to feed the tarpon, make sure you don’t pull your hand back when it’s in their mouth, they have small teeth that might hurt you! No need to say it but bring your swimsuit if you’re planning to take a few breaks while driving from Miami to Key West! While driving for your road trip from Miami to Key West, be careful not to miss this beautiful bridge. It connects Knight’s Key in the Middle Keys to Little Duck Key in the Lower Keys. 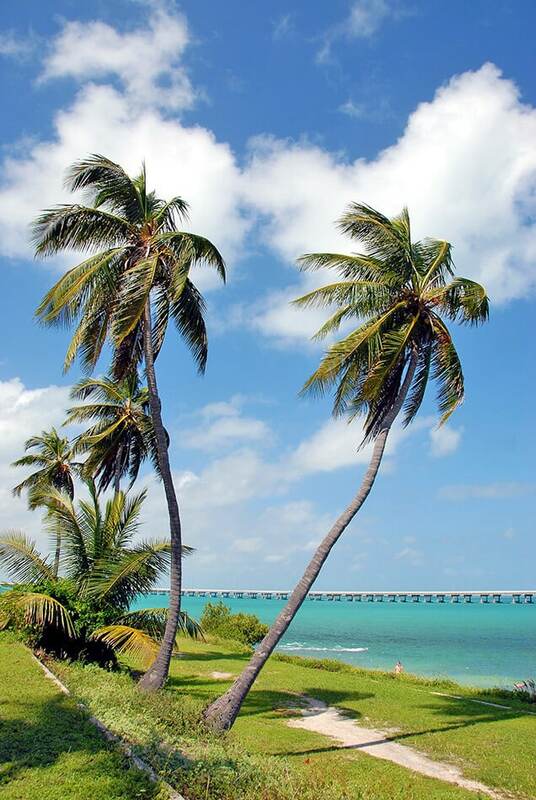 It’s one of the most scenic parts of the drive to Key West so get your camera ready for some breathtaking photography! Instagram, here we come! A little curiosity: the bridge splits at a certain point, as the old part is now used only by pedestrians and cyclists, while the new one is open to vehicular traffic. Your road trip from Miami to Key West is over but there’s still so much to do and see. Walk over to the Ernest Hemingway Home & Museum. It’s the place where the writer lived until his death. If you love cats like us, you won’t forget so easily this place: about 50 of them live here! I remember going to the ticket booth and finding this beautiful (and chubby) black and white cat at the window. He was probably selling tickets to the Ernest Hemingway Home. Cats will clearly take over the world! While you are in Key West don’t miss the chance to do some super-awesome reef snorkeling with a professional, or if you are feeling adventurous, treat yourself to a jet ski ride to see Mallory Square and other attractions from the ocean! A slice of Key lime pie in Key West is a must. They make this pie using the small limes native to Key West, which are juicier and way more scented. You can stop at the Key Lime Pie Company for a generous slice. Believe me if I tell you that you’ll never forget their lime pie! Spending a night in Key West is mandatory unless you are on a day trip from Miami. One of the hottest activities in the area is bar hopping on Duval Street, one mile long and packed with small bars and old Victorian mansions. 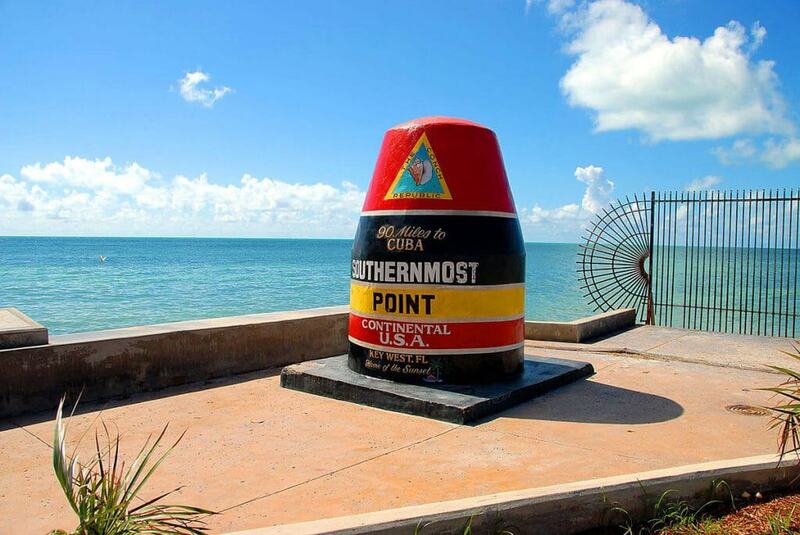 The sunset at Key West is spectacular, so grab your margarita and walk towards the Southernmost Point, the red, black and yellow marker at the corner of South and Whitehead streets. The marker itself is one of the most photographed spots on the island. From this point you will be able to watch and photograph breathtaking sunsets… or sunrises, if you’re an early riser! 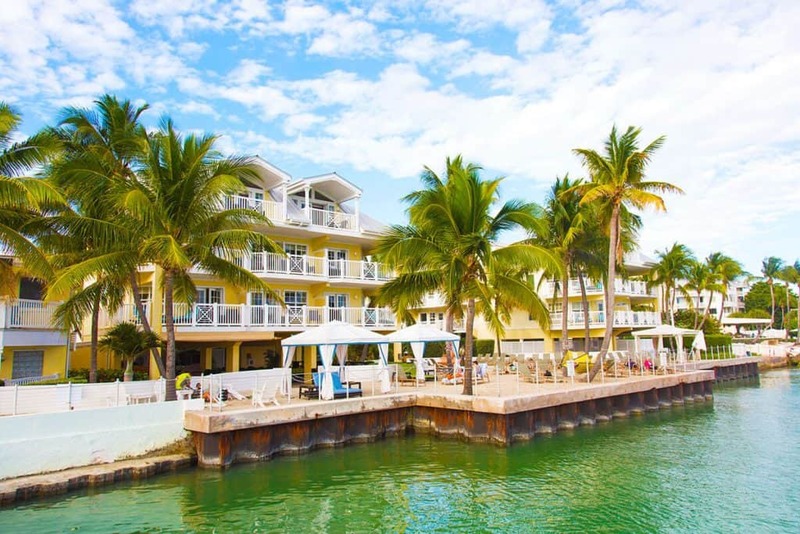 It’s nice to just spend a day or two lazying around at Florida Keys! Stop at Robert is Here, in Homestead! The locals know it as the “Disney World of fruit stands” and for a good reason! This huge shop opened in 1959 and has been selling tropical fruit, milkshakes and yummy treats to the foodies ever since. It’s the perfect stop on the road trip from Miami to Key West if you’re looking for vegetarian or vegan options for lunch. We always make sure to stop here because we absolutely love to snack on crunchy fruit and veggies on the scorching hot Florida summer days! The “Key West Pinks” are one of the all time favorite Florida Keys foods you should experience on your Key West vacations. They mature on the coral sand bottoms of the Dry Tortugas, where they develop their distinktive pink color. This kind of shrimp is tender and sweet. You can eat them at the Schooner Wharf Bar in Key West (the locals favorite here is coconut dipped shrimp with mango sauce), or at the Island Fish Company in Marathon (deep fried with hot pepper sauce and ranch dressing). If you’re in for a different kind of treat, the Islamorada Shrimp Shack in Islamorada serves Shrimp and Grits: shrimps sautéed with peppers and onions in a creole sauce, on a bed of grits. I will admit that before we experienced our first drive from Miami to Key West we had never heard about conch fritters. We cook different dishes in Italy and while we eat mussels and clams, we never really tried the large Queen Conch snails. While they’re no longer harvested in the Florida Keys, almost every shack or restaurant on the drive to Key West serves conch fritters. They’re basically small balls of chopped conch, mixed with cheese, chives, bell peppers and onions, deep fried in batter and served with seasonings. It made us think of the Japanese Takoyaki! The best conch fritter you can eat on your trip from Miami to the Keys is served at the Conch Republic Seafood Company in Key West. They serve it with homemade lime mustard. We also found a cute little place in Marathon, the Sunset Grille and Raw Bar which serves them with a delicious pickled ginger sauce. This popular delicacy is the one thing you should make sure to eat on your road trip to the Florida Keys. Almost every restaurant on the islands serves stone crabs with drawn butter or mustard sauce. The best crabs are usually harvested from mid-October to mid-May. In case you have some time in Key Largo, you should stop to one of the spots the locals absolutely love. Key Largo Fisheries sell fresh crabs that you can cook at home, and serve delicious bowls of Stone Crab chowder soup. In case you’re planning a Key West vacation, note down that the best stone crabs are served at the Half Shell Raw Bar. The Spiny lobsters in the Florida Keys are sweet and tender. We enjoyed a delicious dish at A & B Lobster House in Key West. It was the Lobster Thermidor: medallions of lobster meat served in a sauce of thyme and sherry, with wild mushrooms. It’s an historical recipe that has made this restaurant famous since their opening in 1947! In Islamorada you’ll find the Hungry Tarpon restaurant, where they serve broiled spiny lobster tail with tropical rice and a side of asparagus with garlic butter. Last but not least, the one thing everyone should experience at least once on this road trip from Miami to Key West. The absolutely delicious Key Lime Pie! I swear I’ve never, ever tasted such a delicious pie anywhere else in the world, so whenever I manage to visit Florida, whether I can fit in a few day trips from Miami or not, I make sure to eat plenty of Key Lime pie! The best ones are made with the wild lime from the Keys. You will find two types of lime pies. 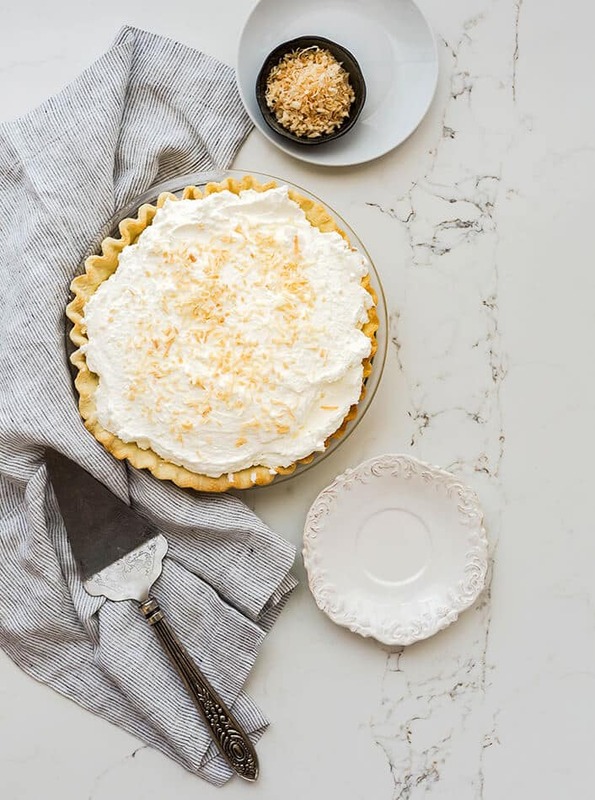 One uses a standard pie crust and a meringue topping. The other uses a Graham cracker crust and whipped cream topping: this one is our favorite! The lime pie is the official Florida State pie, and you will find it everywhere. The best Key lime pie slices can be found at the Kermit’s Key West Key Lime Shoppe (two locations in Key West, at the Key West Bight and on Duval Street), where you can eat the lime pie with Graham cracker crust and whipped cream topping, and the Midway Café in Islamorada, where they make a delicious Key Lime pie with meringue topping. Do you want to experience the Florida Keys like a local foodie? 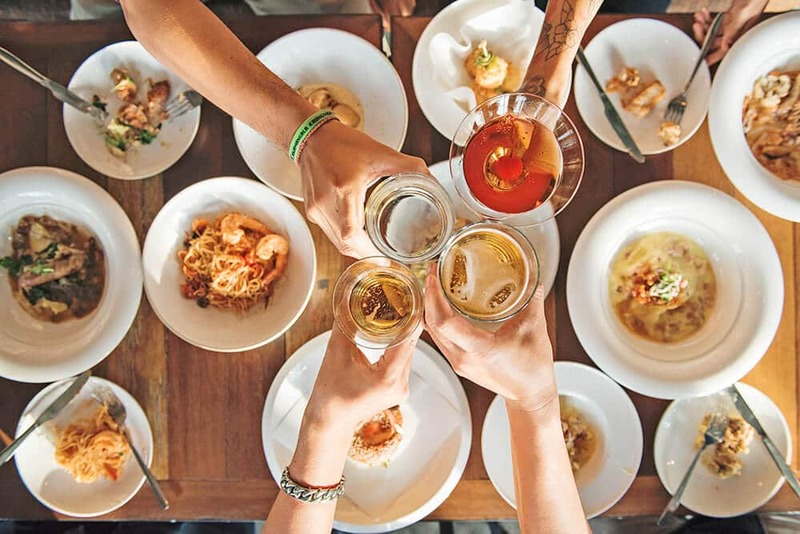 This awesome Key West food tour is perfect for you! 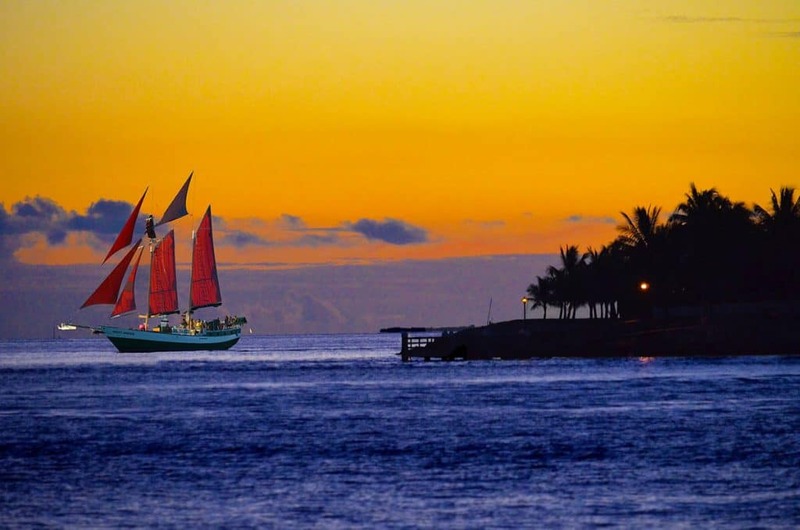 You will spend about 3 hours walking around at leisurely pace, with an experienced local guide who will tell you everything about the history, architecture and cuisine of Key West. During your exploration you’ll be brought to one of the most popular restaurants among the locals (not a tourist trap!) to enjoy a secret dish which will only be revealed to you on your tour. It will be like a treasure hunt! Food and drinks are all included, doesn’t sound awesome? Here you can check prices and availability. If you’re also going to spend some time in Orlando, you might find some useful info in my article on how to plan a trip to Disney World Orlando to save money without giving up on the fun. « The best 45 things to do in Naples, Italy! This post is great, thank you so much. I was looking for somethink like this for to long, and I’ve finnaly find essential info on your blog ! Ciao Michelle! I’m so glad you found it useful! Have fun on your trip to Florida! What beach is that in the first photo? I love the Keys. We love Keys too! That one is the Southernmost Beach Resort! Enjoyed reading your posts! My “Corey Pearson- CIA Spymaster of the Caribbean and Florida Keys” series takes place in this locale. You gave me some location ideas for Vol. 2. Thanks! Robert, not only it’s a pleasure that my posts were helpful, but it’s a honor as well! I’ll make sure to grab a kindle copy of your book on Amazon! Is it this one by any chance? Hi Danny. We are spending a month in the states in December, January. Thanks to your detailed blog, we will now spend the ladt five days taking a road trip from Orlando to the Keys. Any advice on which towns and hotels to stay given we have six days to and from the keys? Your a legend. Keep up the blogs. Ciao! 🙂 Thank you very much for your kind words and YAY for the trip to the US! The Orlando to Key West trip is definitely one of the best we’ve ever had! We visited Orlando afterwards tho, and stayed in Ft. Lauderdale, which might be absolutely perfect for what you need. It’s less expensive than Miami and definitely still very beautiful (sea turtles lay their eggs on the Ft. Lauderdale beaches). I have added a few search boxes for the hotels throughout the article to look for hotels. It’s the service I personally use and use to book trips for my parents as well, because they always make sure they find you the cheapest rate for the best hotels. 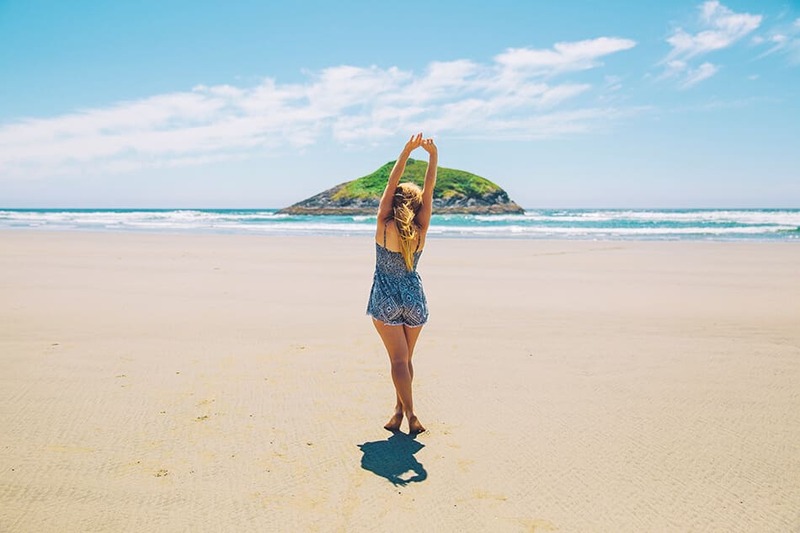 You can use that one and see what’s the best place to stay, according not only to your budget but also to what you want to do! If you want to go see a national park on the road to Key West you could stop the night, for example. I’d definitely suggest one or even two nights to Key West, but that’s me! Danny, she wants to go to the Keys for a 7 day vacation this Spring or Summer. 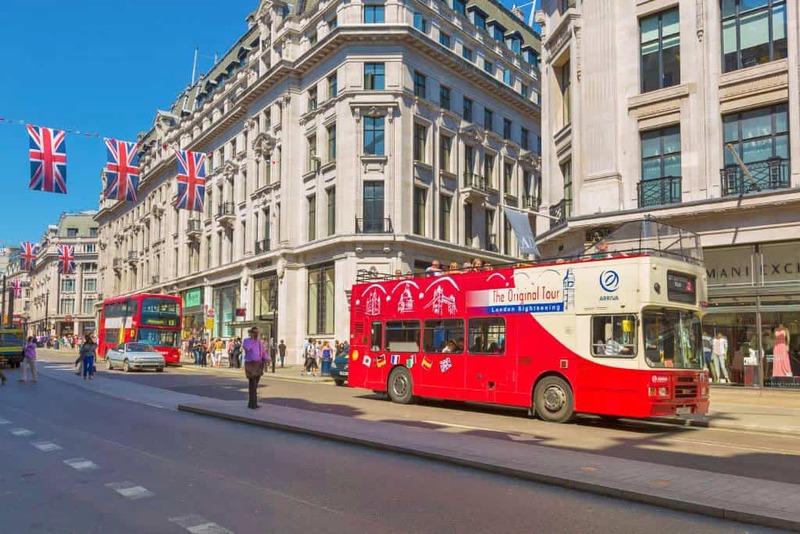 When is the best time to go? Big crowds/festivals not necessary. We’ve never been there. Hello Mike!!! That is SO good, I’m sure you will have a lot of fun! If festivals aren’t for you, then Spring is the best season because it’s less hot/humid. It is considerably more crowded than summer, but then again because summer is not the peak season (due to hurricanes and the damp/warm climate) I have also noticed that some restaurant/shops/activities are closed. So plan your trip for next Spring! Will you stop by in Miami too? We just moved to Orlando and are already planning to make this road trip. It seems like you are transformed from the hustle or Miami into another world of nature and paradise. I have heard about the bike routes they are putting in so it was fascinating to hear about seven mile bridge splitting into a bike only route. This would make quite the ride when they get it all pulled together. We’re definitely planning to get back for more, it was unforgettable! We love road trips because they offer unique experiences you would miss otherwise. Road trips give an immersive experience of the places you pass through. 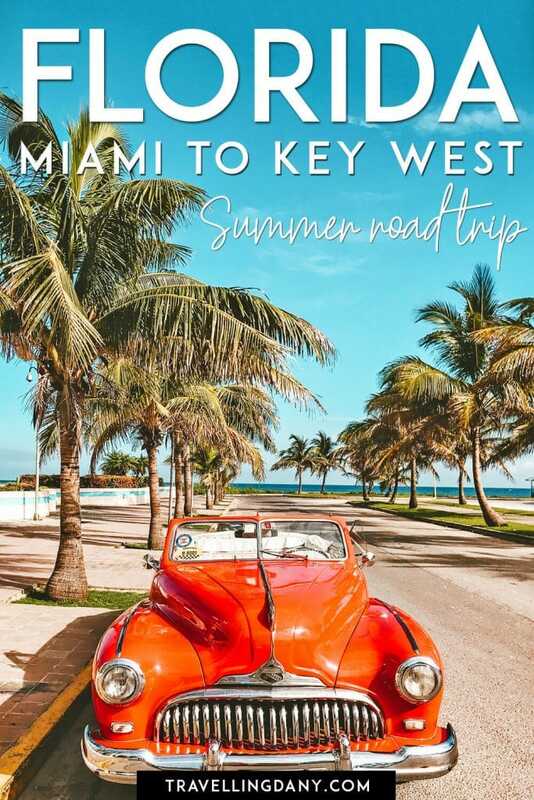 The Miami to Key West road trip looks epic and the places and landscapes are really enthralling. We love them because hubby loves to drive and to take in the scenery. Also we feel free to just stop whenever we want, without necessarily having to follow a specific itinerary. This one has been by far one of our most favorite road trips ever! USA is a country made for the ROADTRIPS. I did couple of ROADTRIPS last trip but this stretch remains untouched. The journey looks absolutely amazing. Would love to try next time I am there. We’re actually very much in love with road trips, not only in the USA! 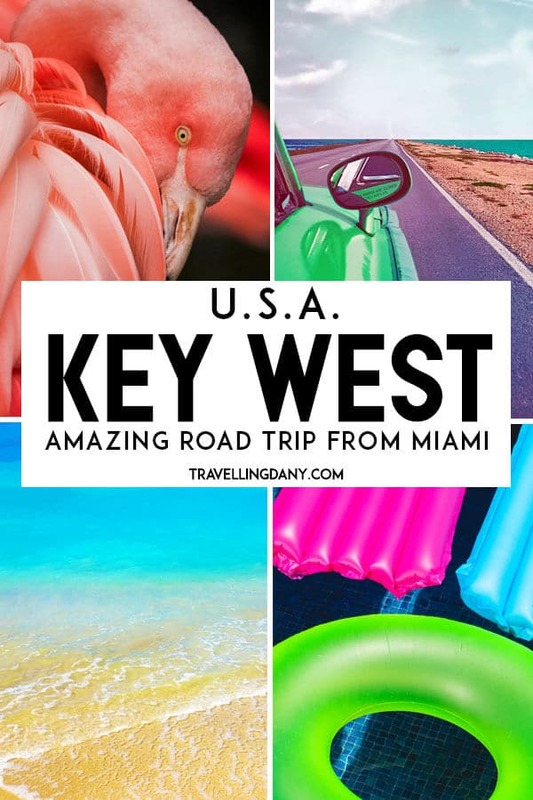 We love the road trip from Miami to Key West – my husband is from Florida so we lived in Fort Myers for a year, and would often road trip down. 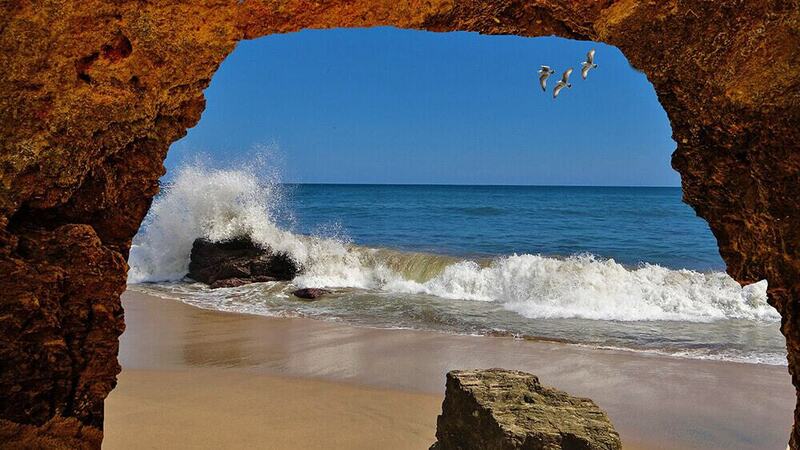 Incredible scenery is’t it! Good tip on organizing the Sunpass, from memory there are a decent number of tolls. Can I be a bit jealous? We’re seriously thinking of going back for more because we LOVED Florida! Since you’re familiar with the area, do you have suggestions on where to buy a delicious key lime pie? I’m sure it’d be useful to all the readers too! You’re SO lucky! I take it you don’t live in the area anymore? We’re actually thinking of getting back for more, Florida stole our heart! I would have gone the Ford Mustang too! I love a road trip in the USA and one of the best bits are the cars you can hire! Heading from Miami to Key West would be such a fun adventure. My end reward would be to try real Key Lime Pie, amazing! You too! I’m so much in love with American muscle cars! As for the Key Lime pie, I’d almost go there if only to get another slice! Lots of shops try to replicate it but the original one is just about unforgettable! This is one epic road trip that we also embarked on, 3 years ago! The road itself is super amazing, the views are breathtaking and each of the ‘keys’, just like you’ve mentioned in your post, has something special and unique to offer. I did not make a note of it but there was this really cool bar that we stopped at (I think it was in Key Largo) on the way to Key West and I absolutely loved that cute little place. We drove back during the sunset and the pink skies were so magical. Reading your post has brought back some great memories, thank you! If you don’t mind sharing and you happen to remember the name of the bar, I’ll gladly add it to this list for our readers! My sister is also going to do this road trip soon, she said she got inspired. 😀 We’re planning to get back to Florida hopefully next year so we’re also giving it a go again. Definitely something you never get enough of, right? Oh wow, sounds like a real epic adventure. Learned a lot of things here like Key West’s proximity to Cuba! That glass-bottomed boat tour in the first undersea park is something I’m up for! It’s a great way to see the reef without having to dive in! I’ve always wanted to do this drive! I’ve only ever been to Key West on a cruise AGES ago for a day and it just wasn’t enough time to enjoy this little paradise off the shores of Florida. I want to go to Hemmingway’s home more than anything and see the cats there too! Haha my parents have cats like from the Hemmingway house that have the extra thumb as you might call it. Hi Loved your post 🙂 I am planning a company trip for 60 people arriving in Ft Lauderdale March 6th and travelling do to Key West on March 7th – any good tips as to where we should have lunch ? Thought somewhere in Marathon ? Hi Lene, thank you very much, I’m glad I could be of help! I think the biggest challenge would be to find a place big enough to host 60 people: booking in advance in this case would be mandatory! Marathon could be perfect, according to the kind of lunch you want to have there are several cute places you could book your group at, fish, meat and if I’m not wrong there’s also a nice place where they make great bagels! My sister just came back from Miami, visited key west, and barely took any pictures. She told me I’d love it and I can tell from your pictures I would! The photos are beautiful. How did I not know about Hemingway’s Home & Museum in Key West?! I’ve only been to Florida once (Miami), and kick myself that I didn’t know that all of this beauty, architecture, history, and fresh fruit was so close! Thanks for the thorough, informative post! I confess I ran over there because I wanted to see all the cats, as I’m cat-bsessed! 😀 But hey now you have the perfect excuse to get back for more! I really enjoyed this post, love your photos. Key West sounds so interesting, and beautiful, the Seven Mile Bridge is stunning! I’m glad you liked reading it! Thank you! How is it to live there? We always wonder! Miami looked a bit crowded with tourists but my husband loved the skyline. We will probably head back to Florida next year, we’re in dire need! This is such a nice article. 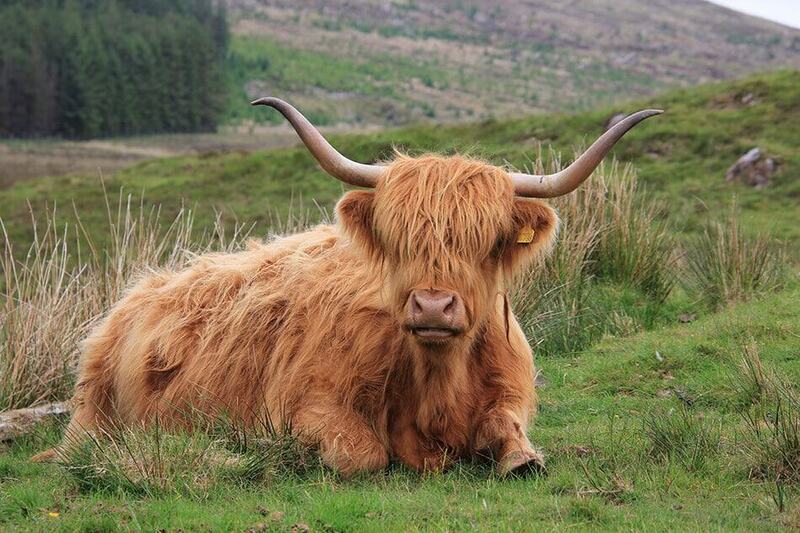 I am currently looking at flight tickets to go there late August. Is that a good time to go? Or will it be hot? I get even more excited when reading your post about this. I will certainly save it for when I have booked the tickets and the planning can begin. Thank you very much, I hope it was useful to you! Haha what would you get then? A minivan? Oh and we loved Marathon Key so much! Did you know that at least a couple of the dolphin that played “Flipper” in the movie came from the Dolphin Research Center? My husband loved driving there, even if it was really hot. September is the time of the year when we’re able to take longer trips… it was very hot but we live in Napoli (Italy) so… we’re kind of used to it! The turtle hospital is just beautiful. They make sure to organize smaller groups so you really get to know the animals and understand what they do. Feeding them is priceless! This is a brilliant itinerary. I had no idea there was so much wildlife in the area and the scenery looks absolutely beautiful. I’ll have to work out a way of combining this with a trip to Orlando. Oh yes! I also met like… a lot of very funny pelicans who basically posed for pictures! And depending from how long you do have, I think it’s feasible. We spent almost one month in Florida, touring it from North to South, but you can either get to Key West renting a car and going for the good ol’ road trip, or just hop on a plane to Miami and rent a car there? You could do this road trip from Miami to Key West in one day but you’d miss a lot of interesting things! This is wonderful! John Pennenkam Coral Reef State Park sounds absolutely fascinating, and all the photos along this route are so cute! It was also one of my favorite! Such a great article, thank you for sharing. Full of lovely details and useful information. I’m planning to head over this way soon so I’ve pinned it to look back in when at the planning stages! I’m glad you liked it, thank you! Let me know when you go there, I’d love to hear your opinions! My husband fell in love with this road trip! He loved driving while I took pictures and videos. I’m sure you will love it, especially if you rented a convertible (fun, fun!). When you get back let me know how you liked it! I had a great experience from Miami to Key West and thanks for bring me back to those nice memories! Although Key West is a small island but it has many iconic and special attractions that makes it worthwhile to visit! I’m really glad you liked it, thank you! Thank you! I think they compared it to Stonehenge because some of the stones are very big and they weren’t sure how they were assembled by just one man. Orlando is so much fun! You’ll have to get back and explore more, that’s the perfect excuse! 🙂 Just make sure to avoid the overcrowded months in Miami, it can be packed and pretty expensive! Haha you’re right! Thank you! You’d have lots of fun! If you go let me know if you liked it!